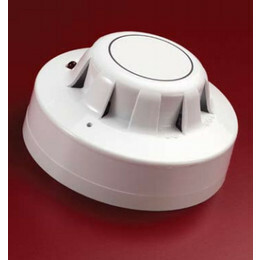 The Apollo Series 65 Ionisation Smoke Detector consists of twin compensating chambers using one single-sided ionising radiation source. A reference chamber is contained within the smoke chamber, both chambers are irradiated by an Americium 241 radioactive source. A current flow is created by irradiating the air in the dual sensing chambers to produce ions that travel to the positive and negative electrodes. Voltage across these electrodes creates an electric field. When smoke enters the chamber some ions attach themselves to smoke particles, this decrease in current flow is greater in the smoke chamber and the imbalance causes the sensing electrode to become more positive. If the monitored voltage exceeds the alarm threshold a signal (current drawn from the supply rapidly increases) is sent to the conventional fire alarm control panel and the fire alarm is activated. During an alarm state the external LED lights up for easy indication. 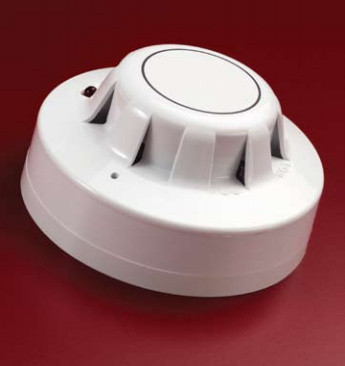 The moulded self-extinguishing white polycarbonate casing is identical to that of the Series 65 Optical Smoke Detector in all but the external LED – on this smoke detector the LED is red during both normal conditions and when illuminated during an alarm whereas the LED on the ionisation smoke detector is clear during normal conditions and illuminates red in an alarm.